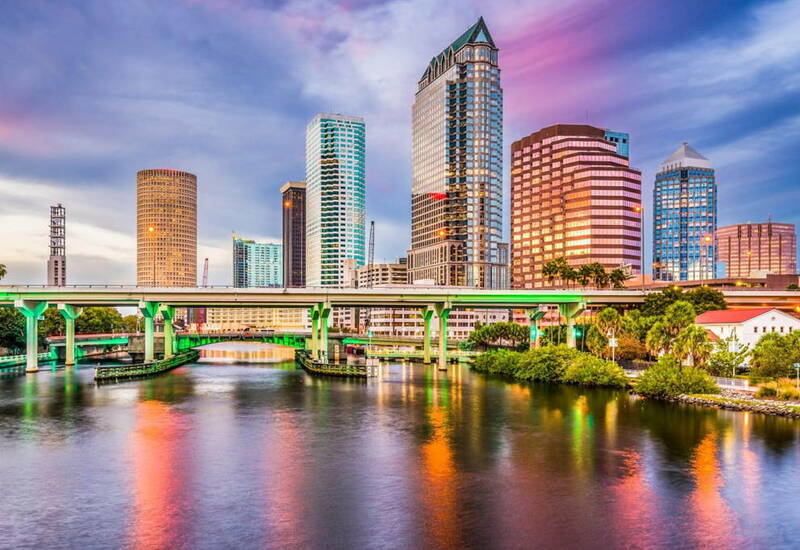 Hair Club Tampa is located in the Tampa Airport Executive Center, a 12-story building just Northeast of the Transworld Building and South of the Hilton Hotel. PARKING: Free parking is available in the adjacent garage. Park on the 5th level which offers a catwalk directly to the building. After entering the building, Hair Club will be the first door on the left. IMPORTANT NOTE: If you choose to use another parking level and the main door of the building instead, proceed to the 3rd floor of the building for the Hair Club office. On Saturdays, the main door will close at noon, so for any appointment beyond that, you’ll have to use the catwalk on the 5th level of the parking garage. I am the parent of Lily, who is a child cancer survivor. She has been cancer free for over 5 years, but she has some lasting effects from her treatments. After her chemotherapy and radiation, her hair started to grow back but not all over her head, and it was very thin. For a few years, it didn’t bother her. But, as she is now 11, she began complaining about her hair and as parents, we became concerned about peers at school and how she would be treated. We reached out to the Hair Club to se did they could help us. The team in Tampa has been exceptional. They have always put her needs first, and have gone out of their way to make her feel comfortable and confident. We are so thrilled with the results, and appreciate the gift that this hair system has meant for our family. We started out with Jane as our hairstylist, and we felt completely at home and at ease. She taught me how to care for the hair and how to maintain it at home. Today, Jane went out of her way to help us with our hair as we had some questions about it. We really appreciate everyone going out of their way for us. Thank you for making our Lily feel confident as she’s growing into a young girl. Yolanda is my stylist and she is very patient, instructive and listens well. I love the Tampa Office, particularly Christine Z. She is so knowledgeable and skilled. One of the finest I've ever been to. I return to Woburn, Ma for the summer. It would be great to see her there as well. I love the Tampa Office, particularly my hairdresser Christine Z. She is so qualified. She is knowlegeable and a highly skilled hairdresser. I hope to see her in Woburn,Ma this summer. At Hair Club, I have complete confidence in whatever my consultant, Christine Z, tells me to do. Everything she said turned out to be just the right thing! She delivers above and beyond the call of duty! I just relocated to the Tampa area, and my experience with the staff. Especially my stylist Christine Z and the staff has been the best experience. I've been a client for almost 20 years and my hair looks flawless and I live my life with no worries. As you all know hair loss is embarrassing and a complete bummer. So, when it was time to get help I choose the Hair Club in Tampa. Neil was the first person I met. He was extremely professional. I felt completely at ease as we figured out the best option. EXT Extreme Hair Therapy And that’s when I met my first stylist Christine Z She gave a scalp massage that I could describe as the best shampoo EVER!! along with years of styling experience, Hair Club product knowledge, kindness and patients helped me to understand. Her smiling face and great personality make my appointments a joy. These professionals are so much more than the degrees and certifications they have earned. If the rating had 100 stars that would still not be high enough to accurately measure their abilities or the high level of service and care they give on a daily basis. Special thanks to Giovanni &amp; Daisy for being so gracious the front desk. Likewise, special thanks to Neil who is always there to help. The team work at Hair Club of Tampa is admirable.Thumbs up and Thank you!!!! Hair Club tiene un excelente sistema para atender a los clientes. En general son muy educados y respetuosos. He recibido atencion de algunos de sus integrantes en especial de la Sra. Christine Z. Muchas Gracias. Hair Club has an excellent system to serve customers. In general they are very polite and respectful. I have received attention from some of its members especially from Mrs. Christine Z. Thank so much. Hair Club has an excellent system to serve customers. In general they are very polite and respectful. I have received attention from some of its members especially from Mrs. Christine Z. Thank so much. Muy contento por el servivcio ! Nunca pense recuperar mi pelo. El servicio al cliente es exelente. llevo poco tiempo con el tratamiento pero ya puedo ver la diferencia en mi cuero cabelludo. La persona que me antiende --- Christine Z tiene manos de angel.. Thank u Cristine Z and hairclub for u amazing job !! I've only been a client for about 8 months but I have to say that I am really impressed. Christine Z has been a great help. She is very knowledgeable about hair care in general but she has given me great tips on using the EXT hair line products. These products have made a great difference in the results of my hair care results. Thank you so much. I've always said that I never got adult hair just baby hair. I was shocked to learn that fine hair was my lot. In January after years of seeing my scalp outline in the mirror, I announced to my husband I was going to an appointment at the Hair Club in Tampa. I know at 67 I should be beyond caring but I hated the way I looked. Neil had me come every two weeks to jump start my results. At my first appointment and a few times after that, I worked with various stylists and then the magic happened for me, I met CHRISTINE Z. She is amazing and so understanding of my situation. I've met people with a gorgeous head of blonde hair like Chris has and frankly they just don't get someone like me and my hair issues. Even my three siblings have tons more hair than me. Hey, I'm the oldest, I should have the most hair. But Chris understands and has really helped me get the maximum from the program and her stylists abilities are awesome. I hope Boston never sees her again. If you are on the fence about Hair Club, give it a shot. Your results might just be like mine, regardless of your age. I love my hair now and you will too. If only I hadn't waited. There has been many years,I wanted to take the leap,to make a change of my appearance,so I regain my confidence in myself to call and schedule an appointment with Hair Club in Tampa,Florida,Center.From the first call to make my appointment,I was treated with so much care and respect for my cause to regain my desired appearance..The whole staff and team were all very helpful and Neil L.,Has help me create my look.Everyone always professional and friendly through this process and I have regained so much personal confidence.All the Ladies up front,especially,Ceyanne,has made the transtion so enjoyable.I give my highest thanks and regards to a fabulous center,I cannot express how different I feel about my life now,and my family and friends admire my youthful look and don't know why.Thank you Hair Club,for making my life,so much better.Five stars to the staff and everyone that made this change possible. Always very professional, and very accommodating and personable, as well. Always made to feel welcome and comfortable. Very happy with this treatments , I starting to see the results, the team it's very helpful. I would recommend it to anyone who needs help , thank you very much. Awesome ! Great service very friendly staff all of them, Richard, Neal, Pete, Cheyenne, Lizanne and everybody else. Product looks and feels sooo GOOD !! My Family, Friends and Girlfriend are shocked how Great it looks. Thank you for doing excellent work. Contract for LIFE. I've been going to Hair Club so long that they are family. They go the extra mile(s) to insure my comfort and maintain a warm atmosphere. When it comes to taking care of my hair Mel is outstanding. She and staff do an awesome job of education and service. I have been going to this location for over 10 years. Great service. The staff makes you feel very welcome and they do an incredible job. I have been a member for the last ten years and Melanie has always gone the extra mile to accomodate my special needs. I would recomend this location to everyone. Been going to this location for 10 years. The entire staff from front to back are great. Quality of the product is exceptional. Melanie does a wonderful job for me. Would highly recommend this location to anyone. BOB S been coming here for over 10 yrs everyone is very nice from cheyeane and liizann to the same girl that has been cutting me all along Melanie. if im not happy about something Steve the asst. mgr will fix it. Great job everyone. Everyone has been very helpful, insightful and courteous. I have my new look ahead of schedule, and just in time for vacation. I can't say enough good things about my entire experience with Hair Club and everyone I have been in contact with, from phone calls, to consolations, to getting my new head of hair and salon care. Peter is awesome!! Thank you all VERY much!! Been coming here for 16 years. Everyone is Great from the front desk to the stylists. Always willing to help you with any issues. Thanks for being here HCM. Tampa Hair Club has a great staff of people. They accommodate you in every way possible. I travel extensively for work and the Tampa Hair Club is my favorite. Keep up the good work! Thanks to everyone there. Great office staff. Tom Lavelle is my hair &amp; scalp therapist. He is very knowledgeable &amp; experienced in hair care. Thank you for doing excellent work. Very few are up to his level of quality and professionalism! Been a member for at least 25 years, starting in Chicago. Been coming to Tampa for 12 years, seen a lot of changes, all for the better. Steve, Pete, Ron, and Richard are all great, as is Cheyenne. My stylist, Zellie is the greatest, today she was out and I had Carla, also great! It's a pleasure to go to the "Club". I joined the hair club this past August. The treatments seem to be working. I feel my hair looks healthier than before. I have been getting complements from many of my friends and family. The staffs are very friendly and they always demonstrate positive attitude. I enjoy attending my hair treatment session because Tom Lavelle is a wonderful hairdresser as well as a pleasant person. Keep up the good work Tom!!!! Wonderful office staff especially Cheyenne and Lizanne! Richard, Pete, Carla, Leila all great! I star a month ago , I have been totally spoiled by my hair dress Tom Lavelle is such a pleasure to go that I will be happy regardless the results :))) My hair is baby hair so little in the back part, I don't see any change YET but still 5 month to go. They have an amazing conditioner that I'm using as a leave in treatment. Also the people at the office is very friendly, they call you to remind your appointment every time. About the price little expensive but as a friend of mine use to say " Is not expensive if you can afford it ".This people knows what it means costumer service!!!! Hair Club has been a refreshing experience. All the staff are pleasant, accommodating and knowledgeable. Issues,if any are resolved on the spot. Many thanks to Steve,Cheyenne and Lizanne. Their greeting when you arrive and front office support is much appreciated. Richard and Ron are always there to help as well. Most of all, ZELLY. For me it would not be the same without Zelly. Zelly knows my likes and dislikes. The attention she gives me I have never ever experienced with any other Stylists. Appointments times are usually right on time. Positive attitude among the staff makes for a very nice experience. Been using the Tampa location for 13 years and they have provided a very consistent level of service. Zelly has been working with me for a few years and does a great job and is always fun to talk with. I have been a HCM client for over 20 years and in different locations and I have always been happy with the product and the service. However, after being with the Tampa Center for several years now, I can honestly say that the management and staff are even more superior than any other facility. My stylist , Melanie, is stellar. I have been a customer of HCL for 15 years. They sell a very good product which gives one a feeling of confidence. When you walk in, you usually see LizAnne and Cheyenne. They set the tone of friendliness which is so important and sometimes overlooked in the service industry. Zelly, my stylist, is a true professional which can be seen in her appointment log that is booked a month ahead of time. Steve and Ron are two of best at their multi task jobs. Service is always good and my stylist is excellent. This is my third hair replacement company. The experience has been the most rewarding. Leila is the best hair care specialist anywhere. Professional, respectful, exact, and fun. No hassle with the hair between appointments. I highly recommend Leila and Hair Club. The service is excellent, but the replacement of units has been a challenge for me, especially if there is an upgrade. I have been a member for a good number of years and must say that the people I have had the pleasure to work with so far are excellent in their practice. As for the hair cutting portion of the process, it can be very inconsistent at times. I have been coming to the hair club in Tampa for over 15 years, all of the people working at this facility have always been professional and respectful to me, My current stylist is Mickey and she is wonderful. My only complaint, is that the Hair Club eliminated the free stylings that we had for years as part of the agreement, this was a very nice feature and helped to keep your clients looking thier best. Hair Club has been a refreshing experience. All the staff are pleasant, accommodating and knowledgeable. Issues,if any are resolved on the spot. Many thanks to Steve,Cheyenne and Lizanne. Their greeting when you arrive and front office support is much appreciated. Richard and Ron are always there to help as well. Most of all Zelly.For me it would not be the same without Zelly. Zelly knows my likes and dislikes. The attention she gives me i have never experienced with any other Stylists. anonymous I have been coming for 3 years and have to say everytime I come it is a pleasant experience with everyone involved. Been going since 1998, have never had any problems. Any issuse that have come up have always been handled quickly and professionally. Would gladly recommend this location as a home base for service. The staff is knowledgeable and professional and also congenial. Over the years I have worked with many stylists - most recently Ron, Melanie, Leila, and Pete. These and many others are excellent! But, a stylist who also uses the product is a great asset to professional hair care. I have one of those stylists now who also has first-hand knowledge of the product and that makes a difference from start to finish. Class operation -- 5 stars! I have been a memeber for several years. Great service, special attention and very good customer care. Richard Hanna is wonderful person and is there when needed. Ron and Zelly are excellent stylists.Steve and Cheyenne are so good with scheduling and accomadating when needed. I have been a member of HCM for over 20 years now. I have several of the Florida locations within driving distance from my home. Tampa has always been my ONLY choice! The staff &amp; management of HCM Tampa have become family over the years because of their high level of professionalism, their willingness to meet my needs, and there overall character. I always enjoy my visits to HCM Tampa! I have been a member for several years and I have had an excellent experience from the first day. The staff is awesome. I started coming to HC Tampa when I visited my father in St Pete. The first experience I had with them was calling desperate (what else is new) for Mighty Tite. The receptionist at the time didn't know me from Adam and she told me she would put it in the mail that day When I asked how I could pay, she said there would be no charge. I started coming in when I had a "hair emergency" even though my salon was in Albany NY!!! They treated me like I was their client by making me feel welcome and comfortable. Peter was my first stylist and we had a ball chatting and laughing and he did wonders with my "hair". When I finally moved here permanently I couldn't get Peter, so I got stuck with Jill. LOL! She is what I affectionately refer to as my "HAIR ANGEL." She has never made me feel uncomfortable or embarassed about my hair loss. She listens when I have a day where I feel sorry for myself about not having thick beautiful hair, then she applies thick beautiful "hair" and I tell her to thin it!! She has given me great cuts that many many people have complimented in the 3 years I've been with her. We have laughed like crazy and cried together as well. I believe that her career choice and her desire to work at Hair Club suits her well. She has certainly changed my life in a positive way and I will continue to bless her for being my "Hair Angel" for the rest of my time at HR. I also commend the staff, especially Steve and Cheyenne who have always come to my rescue each and every time I call in between my service with a system problem. They always manage to fit me in at a moments notice and are very patient with me when I am in desperate mode. I praise the Tampa HC staff for your dedication and committment to changing the lives of men and women alike and giving hope that there is life beyond baldness. Gob Bless!!! I have been a member since little over 3 years. The service provided is just outstanding and highly professional. The hair system brought new confidence into my life. Highly recommended. Love the people there in Tampa. They are always so corteous and willing to help. Consistency in practice is very important to keep customers happy. Love them even if some of the staff can't pronounce my name worth a :-) Keep up the good work. Carla has been the reason I have decided to stay with HCM. She is the only stylist told me how to take care of my hair so it stays and looks its best! I have been going to the Hair Club at the Tampa location for 6 or 7 years now. Best thing I ever did for myself. The staff is always professional and friendly. I see Lelia and she is really fun to talk to. I like to change styles and she's always interested and listens to what I want. She is a great stylist. We exchange life stories and just have a good time. Ron was my first consultant and remain best in my heart. Everyone knows both myself and my husband. I feel we have become part of their 'family'. I am totally satisfied with the staff and service at the Tampa facility. However, I do not like the fact that hair cannot be added to the systems since many of the systems require hair in one area or another. In addition there are times when a system requires additional gray hair to blend with my hair. Best service you can get,always helpfull and very polite,don't know anything better you could ask for. I have been a members of HCM since 1993 and have been going to Tampa for the past 15 years. The staff working there have been very friendy and cordial, and make me feel very comfortable. My hairstylist, Carla,does a great job, and I couldn't ask for a nicer person, but all of the people there who have worked on me have been nothing but nice and very professional. The people at the front desk are also great,along with Steve and Richard. Great service for the last 20 years. Great staff. Always go out of their way to make me happy! Would recommend to anyone. Fun atmosphere! Two weeks in and still very pleased! Wonderful staff, especially Peter, Neil, Richard, Michelle and Cheyenne! I should've done this a long time ago! I've been a member for three years. I'ts the best move I made. I would recommend anyone to join. I am very pleased with the product and the wonderful service I receive at Hair Club - I would recommend it highly to anyone seeking a hair replacement system!